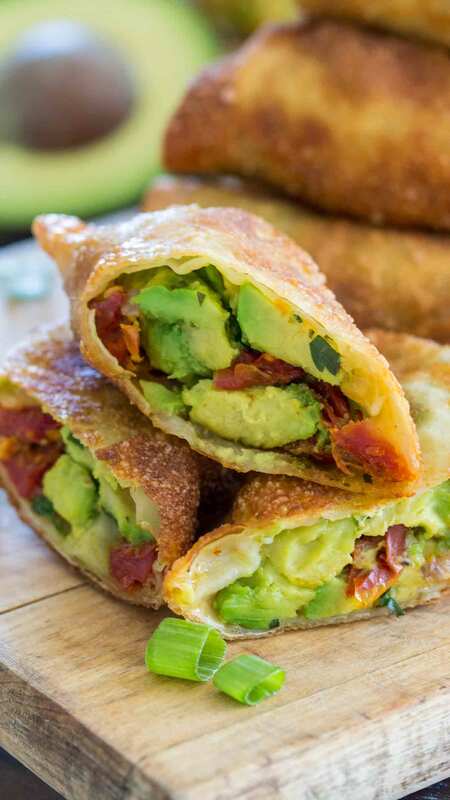 Cheesecake Factory Avocado Egg Rolls Copycat are crunchy, creamy, and tasty made at home any time you want, without the restaurant price tag. These Avocado Rolls are perfect appetizers for any occasions. They can be served at any events and satisfy a bigger crowd. 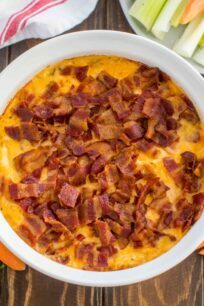 They can also go well with dips which we have made on our blog, like Million Dollar Dip Recipe, Deviled Eggs Dip or Caesar Salad Dip. 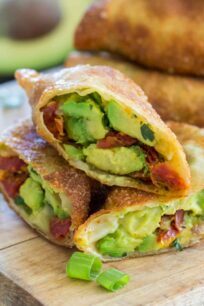 Cheesecake Factory Avocado Egg Rolls Copycat Recipe is my way of indulging into a restaurant style meal at home. 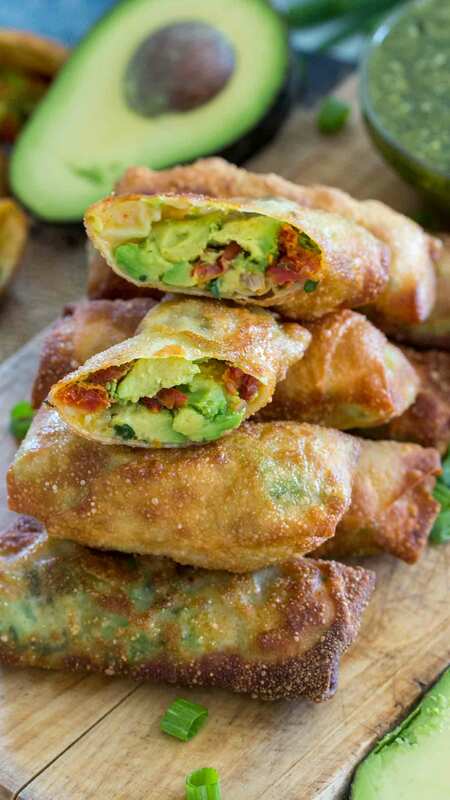 These egg rolls are the perfect appetizer, I mean, if you are an avocado fan, you will go nuts for them. If you are like me in any way, you will make a double batch and just have them for dinner and probably won’t even share them. They are deliciously addicting, creamy and chewy on the inside and crispy and crunchy on the outside. 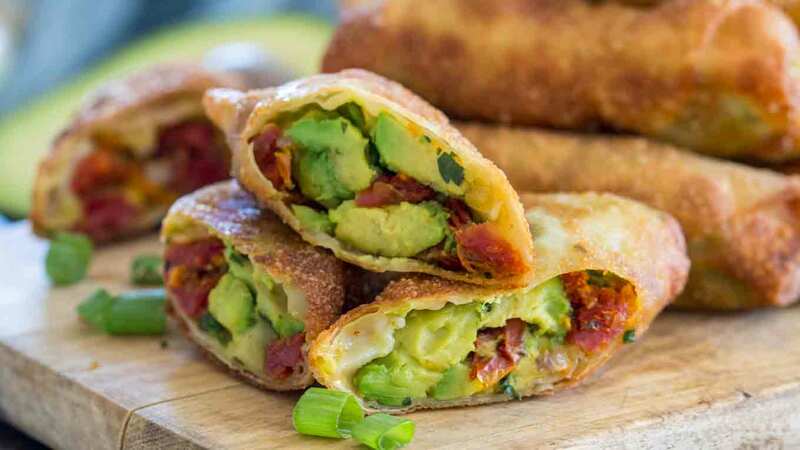 If only you knew how easy these are to make, this Cheesecake Factory Avocado Egg Rolls Copycat Recipe will become a favorite in your household. First, make sure you choose ripe avocados. However, not too mushy or that already start to have black spots on the inside when you cut them. To ripen a hard avocado, store it in a brown paper bag. Also, when you dice the avocados, don’t mash them, you don’t want to end up with guacamole. Roll the Avocado Egg Rolls tightly, and don’t overfill them with the avocado-tomato mixture. Use unsalted cashews, for this recipe I like using raw cashews. In addition, when frying the rolls, it’s best to use vegetable or canola oil. Because, if using olive oil, will result in darker rolls. You need a high score of oil for frying. Fry the rolls just until they start to get golden brown. The ingredients inside don’t need to be fully cooked, so you are looking to only add the crunchy shell. You can serve the rolls with any sauce that you like, or you can make the copycat sauce listed in the recipe. First, choose an appropriate frying oil, these are great: peanut oil, vegetable oil or sunflower oil. Add the oil to a deep pot, fill it no more than half full, to avoid spillovers. Also, use enough oil so that you can submerge a small batch of egg rolls completely. Next, preheat the oil to the cooking temperature of 190 °C / 375 °F or 225 °C / 440 °F. Use a frying or candy thermometer to measure the oil temperature. Make sure the food you are adding to the pot is dry. If needed, use paper towels to remove external moisture. In addition, the presence of external moisture on foods can cause oil to splatter violently. Don’t get too close to the oil and use long tongs, a slotted deep-fry spoon, or a frying basket to add or remove foods gently from the pot. In case of pot catching fire, NO NOT USE: water, flour, or sugar to put out the grease fire, do not try to carry a flaming pot outdoors. To suffocate the fire, USE: baking soda, a damp towel, or a fire extinguisher specifically designed for grease fires. Once you add the rolls to the hot oil, just 1 minute may be enough. Since we are not looking to cook the interior of the food further. Also, keep in mind, smaller pieces of food will cook faster and more evenly than larger pieces. Drain the cooked food on paper towels. In a small, microwave safe bowl, stir together vinegars, saffron powder and honey, and microwave for 1 minute. Stir and set aside. Add to a blender the rest of the sauce ingredients and the honey mixture. Puree until all combined and fully blended. Pour mixture into a bowl and stir, if needed stir in more olive oil to thin it out. In a large bowl, gently stir together diced avocados, chopped sun-dried tomatoes, onion, cilantro, and salt. Place one egg roll on a cutting board, so that a corner is pointing toward you. Brush the edges of the wrapper with egg mixture. Distribute avocado filling evenly onto center. Fold the bottom corner up, 1/4 of the way over the filling. Roll up from side to side, fold top corner over all and press to seal. Add oil to a deep pan over medium-high heat. You should add enough oil, in order to be able to submerge a batch of avocado egg rolls. Heat the oil to 375 degrees F.
Deep fry the egg rolls in batches, for about 3-4 minutes, until golden brown. Remove rolls from oil and place on paper towels to drain excess oil. Now this sounds like a delicious recipe, we don’t have a Cheesecake Factory over here so it’s nice to have some copycat recipes so I get to try bits. Holy Moly this looks DELICIOUS! I have never had this at Cheesecake Factory but I have only been lucky enough to eat there a few times in my life. We do not have one truly local to me. Ours is about an hour and 15 minutes away. I only get over to that town now and then and usually for some specific reason. I will totally make these! Thank you! Wow and wow! This is so amazing! This recipe is so delicious even you can only see it in the photo and it looks like it is so easy to prepare, I will definitely try to make this for my family. Yum! These actually…look better that the Cheesecake factory ones. 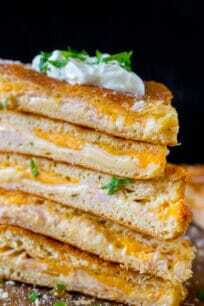 I have to make them!! I love Cheesecake Factory! These rolls look delicious. I haven’t had these at Cheesecake Factory but your version looks amazing. We LOVE avocado and I’m always looking for interesting recipes. We’ll be trying these this weekend. These sound awesome! I’ve never had these at the Cheesecake Factory but will have to try them the next time I’m there. Oh wow! These look delicious! I’ve never tried these before as we don’t have a Cheesecake Factory near us but I’d like to try! I need to make these. These egg rolls are seriously the best thing ever. My goodness! These look positively addictive! 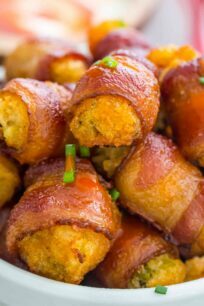 Can I make these in advance and just fry when ready to serve? the wrappers tend to dry out at room temperature, you would have to keep a moist towel on top of them. I would say you make the rolls, and quickly heat up before serving. You can lay them on a baking sheet and heat up in the oven for a few minutes. Yes, you can make them in adavance, just freeze them and then fry them up whenever you are ready. I prefer not to freeze them, but if you have to, the avocado might change in color a bit.